Bachelor in Graphic and Multimedia Planning with praise. 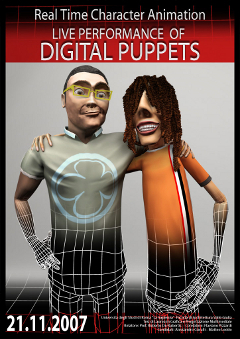 Title: Real Time Character Animation-Live performance of Digital Puppet.(2007) . Low-polygon modelling (4000 faces) with Autodesk Maya, Hi-res modelling with Zbrush for create BlendShapes, NormalMap and paint textures. Rigging for real-time animation , basic skeleton rig for Motion Builder with addictional joints for animate Arms-Head-Spine-Hips through MIDI interface. Switch for Animation Trigger & Digital Puppetry, CharFaceDevice set-up, CharFaceDevice for multiple hand poses switch set-up, VoiceDevice set-up, Animation Trigger Device set-up. Set-up Midi Device “Jazz Mutant Lemur” MultiTouchScreen for animate in real-time. Motion Builder Constraints relations set-up for Real-time character animation.